Our Abpromise guarantee covers the use of ab28486 in the following tested applications. WB 1/1000. Predicted molecular weight: 26,30 kDa. Defects in PLP1 are the cause of leukodystrophy hypomyelinating type 1 (HLD1) [MIM:312080]; also known as Pelizaeus-Merzbacher disease. HLD1 is an X-linked recessive dysmyelinating disorder of the central nervous system in which myelin is not formed properly. It is characterized clinically by nystagmus, spastic quadriplegia, ataxia, and developmental delay. Defects in PLP1 are the cause of spastic paraplegia X-linked type 2 (SPG2) [MIM:312920]. SPG2 is characterized by spastic gait and hyperreflexia. In some patients, complicating features include nystagmus, dysarthria, sensory disturbance, mental retardation, optic atrophy. Belongs to the myelin proteolipid protein family. 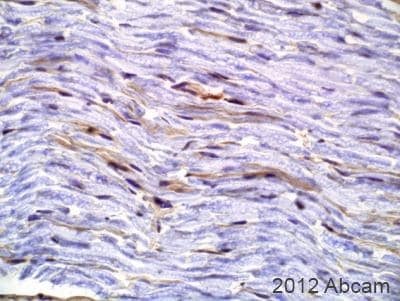 ab28486 staining Myelin PLP in Rabbit brain tissue sections by Immunohistochemistry (PFA perfusion fixed frozen sections). Tissue samples were fixed by perfusion with methanol, permeablized with acetone and blocked with 5% BSA for 1 hour at 37°C. The sample was incubated with primary antibody (1/100) at 4°C for 18 hours. 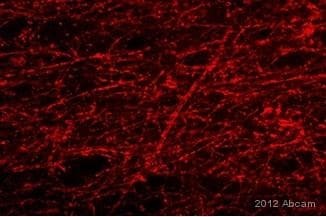 An Alexa Fluor®488-conjugated Goat anti-rabbit polyclonal (1/200) was used as the secondary antibody. 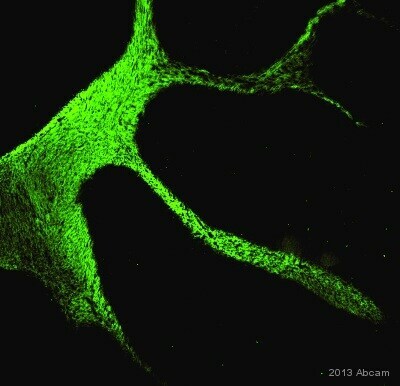 Immunofluorescence analysis of Human brain cells, staining Myelin PLP with ab28486. Cells were fixed with formaldehyde and blocked with 10% serum for 20 minutes at room temperature. Samples were incubated with primary antibody (1/400 in diluent) for 16 hours. 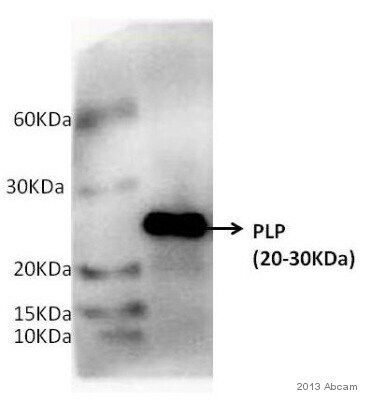 An AlexaFluor®555-conjugated donkey anti-rabbit polyclonal IgG (1/1000) was used as the secondary antibody. Immunohistochemical staining of Myelin PLP in mouse brain thick section using ab28486 (1/1000 dilution). Staining (m) is limited to myelin tracts and oligodendrocytes. ab28486 at a 1/1000 dilution staining mouse brain (white matter) by IHC-P. The tissue was fixed in 10% formalin saline. Antigen retrieval was via hydrated autoclaving at 121°C for 15 minutes followed by 5 minutes in 98%formic acid. 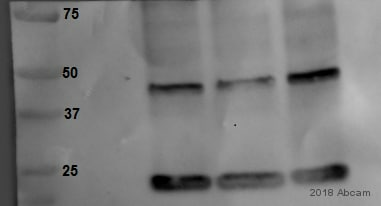 The antibody was incubated with the tissue for 16 hours and then bound antibody was detected using a biotinylated goat anti-rabbit IgG Fc. No bands in Western blot with rat brain lysates. As we discussed, I'm sending a free of charge vial from a new lot on the order ***, which should arrive tomorrow. Please keep me updated about the results with this new lot. We do fully guarantee the results with this replacement lot, and if it also does not work I'd be happy to send a different PLP antibody to try. 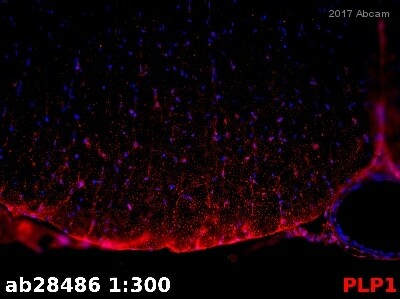 No staining in IHC-P despite troubleshooting. As we discussed, I'm sending a free of charge vial of ab105784 on the order ***, which should arrive tomorrow. Please keep me updated about the performance of this replacement antibody, and if there is anything else that we can do for you please let me know.